Hendel „Hanna“ Tobias, daughter of Tobias Herz, was born about 1807 in Oberdreis. 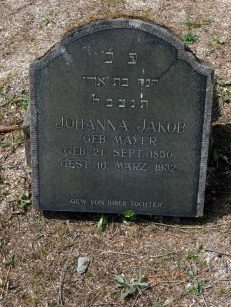 Her husband, Seligmann Jacob, was probably a cousin, because his father Jacob Samuel came from Urbach like Hanna’s mother Täubchen Samuel, and so they likely had the same father with the first name Samuel. Jacob Samuel was born about 1767, worked as a butcher and peddler and had died before 1829. Seligmann’s mother, Guthal Hendel Salomon, was born about 1783 and died in 1869. Seligmann was a butcher and peddler like his father. He was born in 1801 in Urbach and died the same year as his mother, in 1869. There are no graves left of that time and we don’t even know when his wife Hanna died. Seligmann and Hanna had five children of whom we know of. Jette Jacob, the eldest, was born on February 16, 1833 in Urbach. 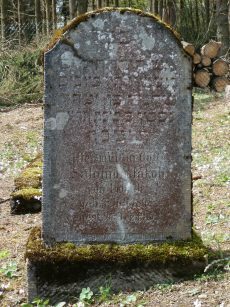 She married Jacob Lilienthal (1828-1870) of Schöneberg, Altenkirchen, son of Baruch Salomon. They had one son, Siegmund Lilienthal, born on March 22, 1869. Siegmund was married to Maria Anna Kahn of Niederzissen, Ahrweiler. Siegmund and Maria Anna had 3 children. Jacob Lilienthal, born on November 10, 1895 in Schöneberg, was married to Frieda Gottschalk of Niederzissen. He took over his father’s butcher shop and ran it until it was “aryanized” after Kristallnacht 1938. His family then had to move to Cologne from where they were deported to Minsk in 1942. Their children Edith (born in 1924), Walter (1926) and Gertrud (1932), perished together with the parents. Siegmund and Maria Anna’s daughter Lina was born on May 8, 1897 and married Georg Lando of Lodz, Poland. He earned his living as a shoemaker in Schöneberg. The couple emigrated to Palestine and it’s said that they took Lina’s parents with them. We don’t have any information about their fate or children. The youngest daughter of Siegmund and Maria Anna, Frieda Lilienthal, was born on May 25, 1903 and married Moritz Schaumburger of Westerburg. They had one son, Rolf Simon, born on February 9, 1936. The family was deported to Theresienstadt in 1942, then sent to Auschwitz on October 6, 1944 and probably killed upon arrival. In 2007, the main school of Westerburg was named after Rolf Simon Schaumburger, but in 2010 it was merged with the “Hans and Sophie Scholl middle school” and since then it’s only called “Realschule plus” without any reference to their former name givers. Jakob Jacob was the second child of Hanna and Seligmann. He was born on November 8, 1836 but we don’t know anything about his life. Daughter Betta Jacob was born on August 6, 1839 in Urbach and married Simon Kahn (1851-1930) of Niederzissen, Ahrweiler. They moved to Horhausen, Neuwied and had three children. Rosalie Kahn was born on March 17, 1878 and married Bernhard Gottschalk of Niederzissen. The lived in Bad Bodendorf, Ahrweiler. Both were deported to Treblinka in 1942 and are reported missing. Their three sons Max (born in 1900), Siegfried (1903) and Jacob (1905) were all able to emigrate to the United States with their families. The second child of Betta and Simon was son Siegmund, born on April 9, 1879. He was married to Lina Bock and had one daughter named Betty (1911). While Siegmund and Lina where deported in 1942 to an unknown destination, Betty was able to emigrate. She died on January 4, 2004 in New York. The third child of Betta and Simon was Salomon Kahn, born on March 28, 1883 in Horhausen. He was married to Klara Caroline Bock of Münchholzhausen, Wetzlar. In 1926 they moved to Heimersheim, Bad Neuenahr-Ahrweiler. They were both deported to Krasniczyn together with their youngest daughter Ilse Kahn (1924). Their elder daughter Bella Kahn, born in 1912, married her cousin Siegfried Gottschalk and emigrated to New York with her husband. Son Hugo (1915) was married to Ann Cohen and also emigrated to New York. 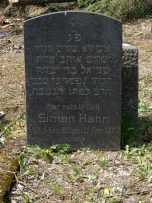 Simon Kahn was buried in Puderbach in 1930, but we don’t know when or where his wife Betta Jacob Kahn died. The fourth child of Hendel and Seligmann was Tobias Jakob. He was born on April 9, 1846 and married Therese “Täubche” Kahn of Giershofen, Dierdorf. They had one daughter, Ida, born in 1886, who married Louis Daniel (1847-1953) of Großmaischeid, Dierdorf. 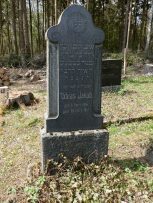 Tobias Jakob died on April 27, 1917 and was buried in Puderbach. 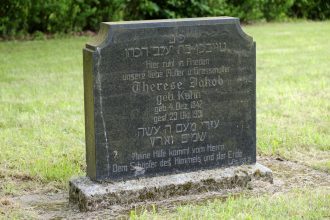 Following his death, Therese moved to Dierdorf to be with her daughter and was buried there in October 1931. 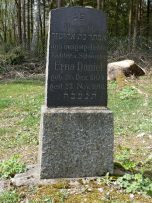 Ida and Louis’ eldest daughter, Erna, born in 1904, died at the age of 13 and was buried in Puderbach. They later emigrated to the United States with their other children: Solly (1906), Sabina (1907), Herta (1910), Hilde (1911), Leonie (1917) and Trude (1920). Ida Jakob Daniel died in New York on March 27, 1963. Son Salomon was the fifth child of Hendel and Seligmann. He was born on July 3, 1848 in Urbach. He was married to Johanna Mayer (1850-1932) of Grenzhausen. Their first son, Siegmund Jacob, was born on April 23, 1884 and married Else Meyer of Ebersheim, Mainz. They were both deported to Theresienstadt in 1942 and killed in Auschwitz in 1944. Their daughter Franziska, born on March 24, 1914 emigrated to Great Britain. The second child of Salomon and Johanna was daughter Bertha Jacob, born on April 22, 1886 and married to the vintner Josef Jonas of Rheinbrohl, Bad Hönningen. Bertha was the last Jew to die in Rheinbrohl on December 10, 1941. Her husband was deported to Theresienstadt and then Treblinka in 1942. Her son Sally (* March 4, 1907) was deported to an unknown destination and perished. Her son Emil, born December 15, 1908 in Rheinbrohl, was in Rio de Janeiro, Brazil in 1963, together with his wife Gertrud Wolff of Bingen and died in Buenos Aires, Argentina on July 15, 1970. Daughter Erna fled to the Netherlands. Ferdinand Jacob, the third child of Salomon and Johanna was born in 1893 but we don’t know anything about his life. Salomon died on December 27, 1915 and his wife Johanna on March 16, 1932. They were both buried in the Jewish cemetery of Puderbach. Ebbinghaus, Gerhard: Die Geschichte der Juden in Urbach/Westerwald In: SACHOR. Beiträge zur jüdischen Geschichte in Rheinland-Pfalz. 2/1993 Heft Nr. 5 S. 62-72.